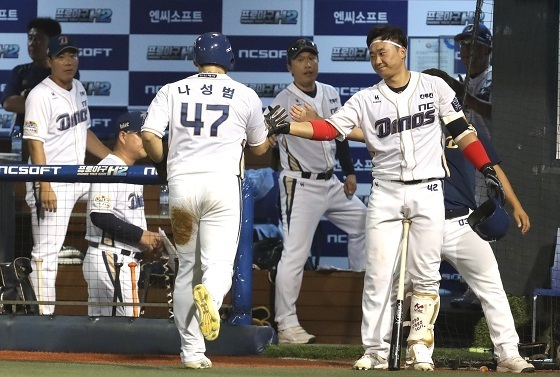 The NC Dinos won 4-1 against the Samsung Lions on Sunday in a game that was unremarkable except for one aspect – it ended with a triple play. The occurrence of a single triple play is rare enough; only 68 triple plays have been turned in the Korean Baseball Organization’s 37-year existence. But a game-ending triple play is even rarer; Sunday’s game was only the fifth such occurrence. A triple play most commonly occurs in one of two circumstances: either a sharp ground ball hit to the third baseman near the third base bag, or a line drive hit while runners are in motion. This triple play was one of the first variety. In the top of the ninth inning, Darin Ruf walked and Cho Dong-chan was hit by a pitch, putting runners on first and second with no outs. Then Jung Byung-gon got on top of a breaking ball from NC closer Im Chang-min and hit it right at third baseman Mo Chang-min. Mo fielded the ball and took two short steps to third base to force out Ruf. Then around the horn the ball went, first to second baseman Park Min-woo, forcing out Cho, and then to first baseman Xavier Scruggs, completing the triple play. The triple play was the fourth turned in the KBO this season, the second by NC. Samsung’s only run of the game came on Park Hae-min’s eighth inning solo homer. All 4 of NC’s runs were driven in by star right fielder Na Sung-bum, who went 3-for-4 with 2 home runs.